David “Bryan” Williams, 76, of Bowling Green, Ohio and formerly of Maumee, Ohio passed away Friday February 1, 2019. He was born January 23, 1943 in Decatur, Illinois to the late Lynes “Bill” and Leona (Vendelsky) Williams. He married Nancy Summers on September 3, 1966 and she survives in Bowling Green. He was a graduate of Schlarman High School where he was named 1st team Parade All American. In 1961, he was named Mr. Illinois Basketball. He then went on to attend Xavier University where he received a basketball scholarship. In 1966, Bryan was drafted by the St. Louis Hawks. He was inducted into the Illinois Coaches Basketball Hall of Fame. Bryan worked as a teacher and basketball coach at Libbey High School. He was a member of The Knights of Columbus and enjoyed fishing, watching Nebraska football and his two cats, Glory and Spanky. Along with his wife of 52 years, Nancy, Bryan is survived by his children Ellen (Richard) Barnhizer, Bryan (Stacey) Williams, Molly (Steve) Crowe, Amanda (Phil) Siegel and Angie (John) McEwen. He is also survived by his 10 grandchildren Drew (Alex) Williams, Libby Crowe, Morgan Williams, Andrew Crowe, Madeline Williams, Jillian Crowe, Doug Siegel, Scott Siegel, Thomas McEwen and Matthew McEwen, brother James (Linda) Williams, sister Joyce Wright (Late Fred) along with numerous nieces and nephews. A Memorial Mass will be held on Friday February 8, 2019 at 11:00 a.m. at St. Aloysius Catholic Church, 150 S. Enterprise St. Bowling Green, Ohio 43402. Father Mark Davis will officiate. Visitation will be held Friday morning at the church from 10:00 a.m. until the time of the Mass at 11:00 a.m. Funeral arrangements have been entrusted to Dunn Funeral Home in Bowling Green. 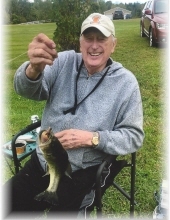 Memorial contributions may be given in his memory to Ohioans Home Health Care, 28315 Kensington Ln. Perrysburg, Ohio 43551. The family would like to thank Holly Sapp with Ohioans Home Health Care for all of her loving care and patience. To send flowers or a remembrance gift to the family of David "Bryan" Williams, please visit our Tribute Store. "Email Address" would like to share the life celebration of David "Bryan" Williams. Click on the "link" to go to share a favorite memory or leave a condolence message for the family.